Cowsen Gill, near Keasden. 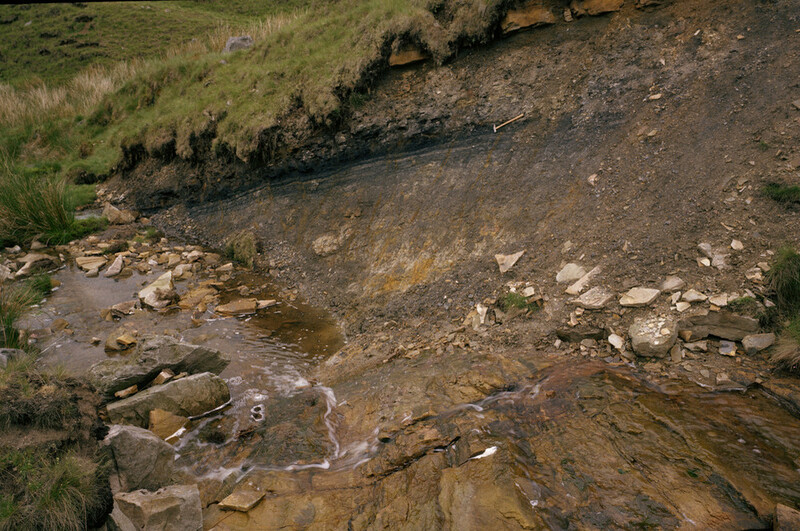 Thin coal and seatearth in the Roeburndale Formation. The following section is exposed in the north-east bank of Cowsen Gill: sandstone fine-grained, quartzitic, passes upwards into 2.40 m. ganister. Siltstone, sandy, micaceous, finely laminated 0.80 m. Coaly siltstone and mudstone: dark grey, silty mudstone with coal lenses in 70 mm. bed, 150 mm. above base. Sparse Lingulid fauna in top 100 mm. Gradational passage into overlying siltstone 0.30 m. Seatearth sandstone, soft, friable, silty 1.40 m. Sandstone, fine-to medium-grained, slightly feldspathic, poorly bedded with irregular cross-bedded top. Base at least not seen. Base of section 1.20 m.
This page was last modified on 5 June 2014, at 14:52.